Chicken fingers are one of my favorite dinners. They are easy to make and bake in no time. I also love the variety of flavors to coat them in. 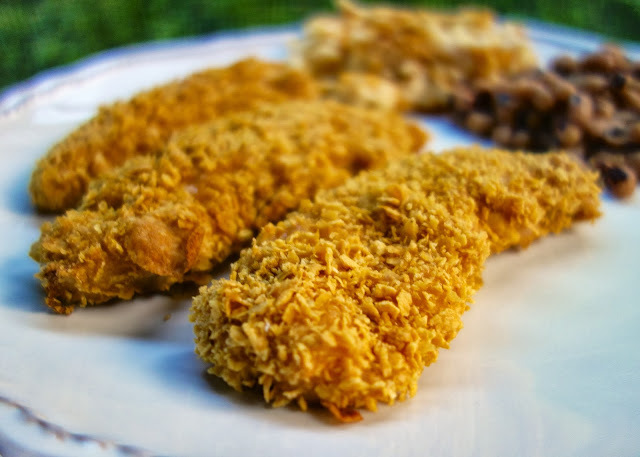 These Maple Cornflake Chicken Fingers are delicious! They are crunchy with a hint of sweetness from the maple syrup. Make sure you use real maple syrup and not pancake syrup. 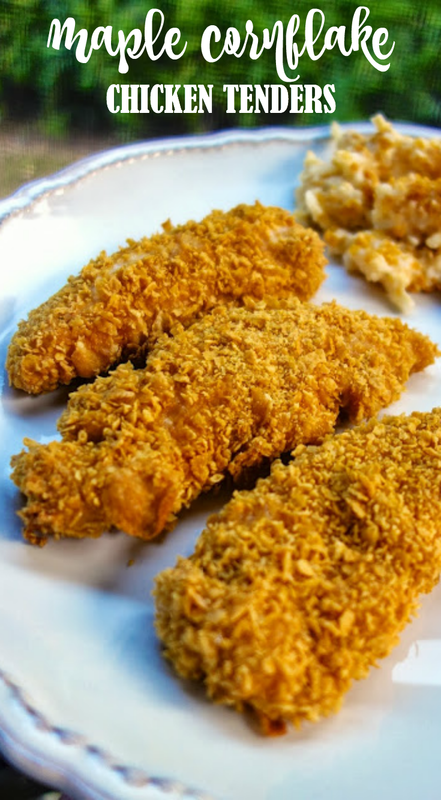 The key to good chicken fingers is dipping the chicken tenders into flour before dipping them into the egg mixture. The egg grabs hold of the flour and allows the cornflake coating to stay on. We really enjoyed these chicken fingers. They are great served with some honey mustard for dipping. Heat oven to 450. Line cookie sheet with foil; spray with cooking spray. In a shallow dish whisk together egg, maple syrup and milk, set aside. In a second shallow dish, combine flour and cajun seasoning, set aside. Place cornflake crumbs in a third shallow dish, set aside. Dip chicken tenders into flour, then into egg mixture. 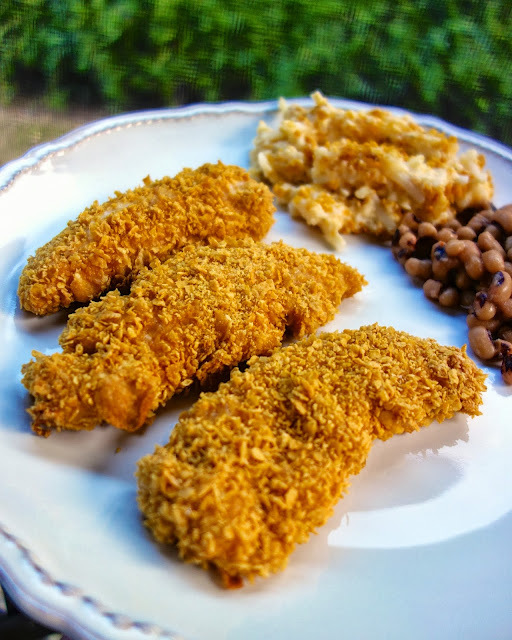 Coat chicken tenders in cornflakes. 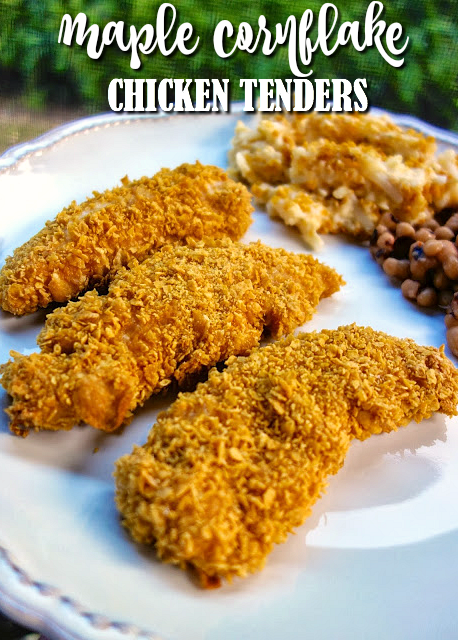 Place coated chicken tenders on cookie sheet and spray with cooking spray. I'll bet these would make good appetizers too, in bite sized nugget shapes. Glad I have cornflakes in my cabinet!